A suspected fake mad man was apprehended along Itedo lekki phase 1 area of Lagos. According to reports, the man was was caught with 2 latest iphone 8 and lots of cash. 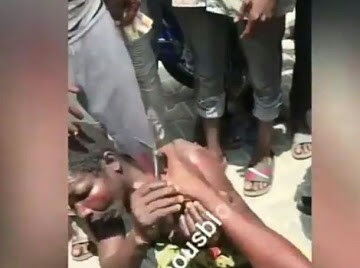 While receiving the beating of his life, the angry mob asked who sent him but the fake mad man refused to answer instead he insisted on getting his sim card. He kept on screaming "my SIM, my SIM " Please can I have my SIM card.